To download a printable .PDF version of this report, click here. What signals did sector leaders and stakeholders send? A high-level overview of input received at roundtables in Charlottetown, Montreal, Ottawa, Guelph, Winnipeg, Saskatoon, Calgary and Vancouver. To seize this opportunity, the aspirational vision — being the trusted global food leader — must be the lens through which we assess all relevant policies. Strengthening Canada’s competitiveness in global food production could drive economic growth for decades to come. Those within the food system  have long recognized both the core strengths and untapped potential of the sector. But there is now increasing awareness outside of our food system of the tremendous opportunities presented by a burgeoning global population, a growing global middle class, and changing consumer trends such as increased demand for higher-value food, like proteins and functional foods that have health benefits beyond simple nutrition. 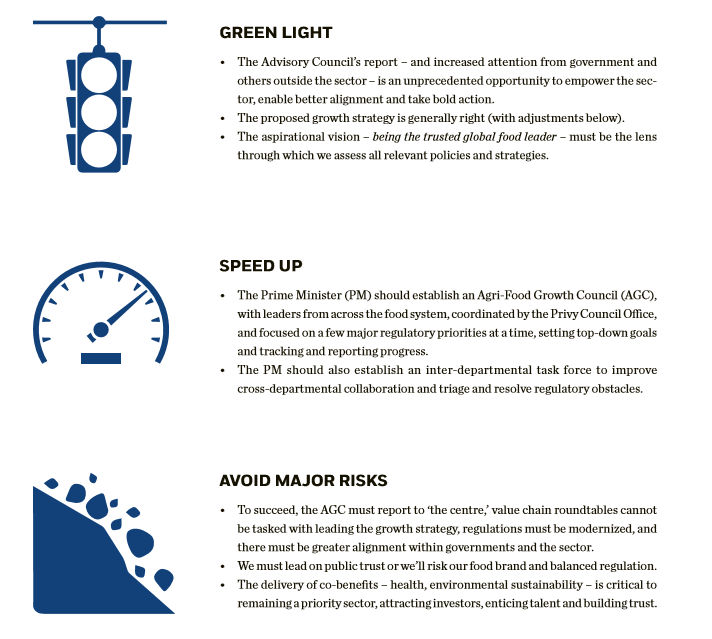 In February 2017, the Advisory Council on Economic Growth, established by the Minister of Finance, released its second wave of recommendations, which emphasized the potential for Canada to become “the trusted global leader in safe, nutritious and sustainable food for the 21st century.”  The Advisory Council recommended the government work with the private sector to take a targeted approach to removing growth obstacles. It also recommended the development of a growth strategy, the building blocks of which should include: setting an ambitious aspiration; launching a few bold pilots; boosting public-private collaboration; and implementing core recommendations (on innovation, infrastructure development, broadening trade agreements in Asia, immigration and a FutureSkills Lab). 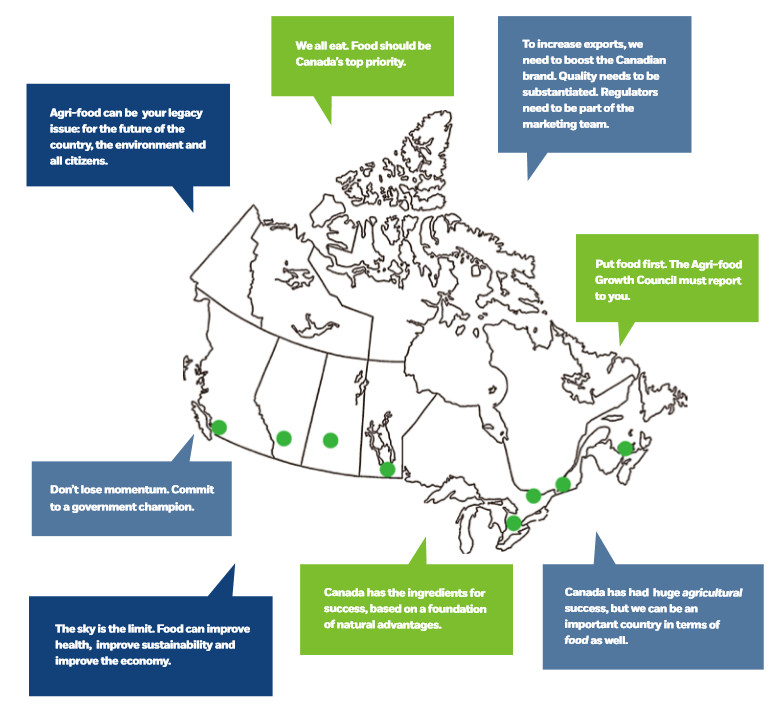 a coast-to-coast consultation process focused on what it will take to make Canada a global agri-food powerhouse. What do food-system stakeholders and governments need to execute on? Where should we focus our attention? What are the gaps in the recommendations put forward by the Advisory Council? How can we build momentum and galvanize the sector around a growth agenda? The increasing recognition of agri-food’s potential as an economic driver is exciting. The Advisory Council’s report — along with the 2017 federal budget, which identifies agri-food as a key driver of innovation, alongside digital and clean tech — is an unprecedented opportunity to empower the sector, enable better alignment and take bold action to build an even more dynamic and globally competitive food system. To seize this opportunity, the aspirational vision — being the trusted global food leader — must be the lens through which we assess all relevant policies. The government should act quickly to establish an Agri-Food Growth Council (AGC), consisting of leaders from across the entire food system. 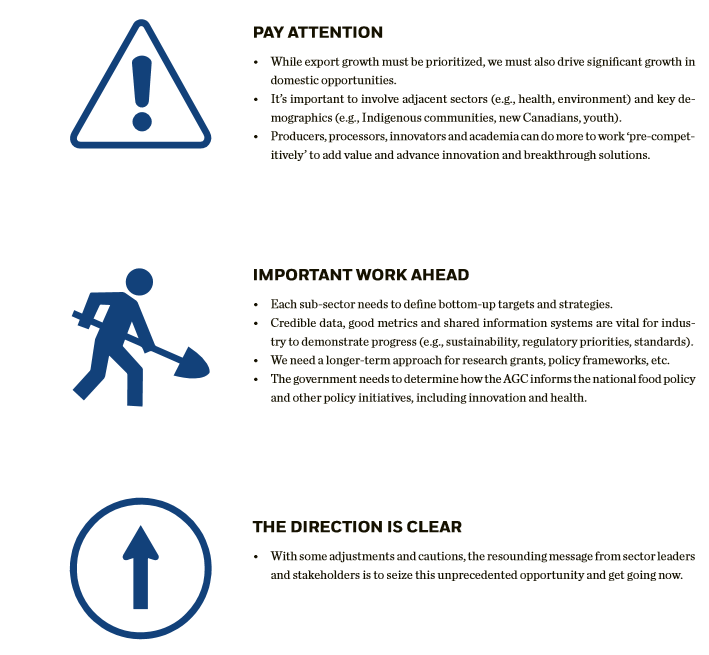 The AGC has the potential to get this highly diverse sector out of its many silos and galvanize it around a growth agenda. It should focus primarily on a few major regulatory priorities at a time with the aim of making our regulatory process a competitive strength. It should also provide leadership on top-down goals. Recognizing the cross-departmental nature of agri-food issues, and the need for a whole-of-government approach and leadership at the highest level, the AGC should be established by the Prime Minister and coordinated by the Privy Council Office. It should report on progress every six months. Sector leaders and stakeholders were clear that the Value Chain Roundtables are not the appropriate vehicle to take the growth strategy forward. To be successful, it requires leadership from a representative AGC and from the centre of government. We need industry leadership, too. The proposed “hub” and sub-sectoral action team concepts are potential catalysts for this. 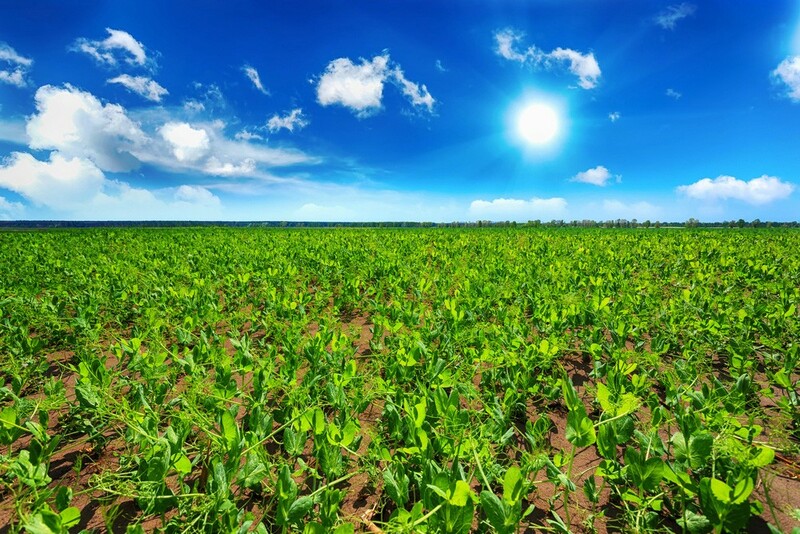 Bottom-up targets and strategies can bring diverse players together on a new approach, such as being “the most sustainable supplier of protein in the world,” as suggested by some roundtable participants. Many of the regulations for the agri-food sector are out of date, unnecessarily impeding investment, innovation and competitiveness. We need modern regulations that are science-based, risk-based and balanced. Our regulations need to be a competitive advantage. Modernization is an essential part of that. So, too, is benchmarking where Canada is relative to global competitors. We need to ensure that our regulatory process can demonstrate, in a data-driven and transparent fashion, that our food is the safest, most sustainable and most nutritious in the world. Public trust is central to our food brand. It’s also vital to ensuring a competitive business environment because, without trust, more restrictive policies could be introduced that inhibit competitiveness. Educating consumers and improving their “food literacy” — from fork back to farm, including trust in science — is an important part of risk-mitigation. Focusing on environmentally sustainable growth — reducing pollution, addressing climate change and enhancing natural capital — is critical. Sustainability not only delivers on expectations that enhance public trust, but it’s also a driver for reducing costs, adding new value, enhancing productivity, ensuring profitability and creating production-related resilience. Sector leaders recognize the need to improve how industry measures and communicates sustainability. Emphasizing the other co-benefits of Canadian food is also essential. Canadian food can be positioned as a “solutions provider” through its health attributes and nutritional quality. As healthcare costs put an increasingly significant strain on public budgets, the linkages between our food system and health outcomes need more attention. To remain a priority sector, attract investors, entice talent and build public trust, our economic growth strategy must deliver co-benefits. Food-system players recognize the need to “own” the growth strategy and are eager to do so, but they need to have confidence in government processes so they can focus on creating value-added opportunities and delivering co-benefits across the sector. One of the main reasons for industry hesitation to invest is the lack of alignment within government. As we heard, “It’s as though Agriculture, Innovation and Economic Development, and Health aren’t talking to each other.” To ensure food-system players are confident and profitable enough to invest, we need improved alignment and modernized regulations that don’t unnecessarily impede innovation. Canada needs improved research capacity, which is seen as less than half of what it should be for the size of the industry. Most research funding comes from governments. We heard that, “Government should not do less; commodity groups do some but could do more; industry needs to step up.” We also heard about the importance of confidence and profitability in making that happen. To ramp up exports significantly, we need leadership and alignment, modernized regulations, a strong food brand, investment and innovation. We also need preferential trade agreements with high-potential markets in Asia. We need to seek regulatory harmonization to the greatest extent possible — ensuring a level playing field that delivers high-quality, safe food. We need to tackle non-tariff barriers and do more to shape non-government international standards. We also can’t forget about the domestic market. Many small and medium enterprises don’t have the capacity to be in the export market, at least not yet. Global and domestic food-system players face similar challenges as they seek to develop new value-added opportunities. To grow our domestic market, we need swift action on internal trade barriers: In Charlottetown, we heard that “it’s often harder to ship to New Brunswick than it is to the U.S.,” and we heard similar frustration elsewhere. Another way of supporting domestic players is through ‘consortium’ approaches, which enable better information-sharing. Those are the main, broad directions in which our roundtable discussions went. The need for leadership, alignment and a systems approach was a dominant theme, as was the need to modernize regulations. There was especially strong interest in the establishment of an industry-led Agri-Food Growth Council, but sector leaders and stakeholders were adamant that it report to ‘the centre’ and represent the entire food system. There was also strong support for an inter-departmental task force to break down silos within government and lead regulatory modernization. Both of these initiatives should be set up quickly. At every roundtable, bolstering public trust, enhancing our food brand and delivering co-benefits were identified as crucial to strengthening our global competitiveness. Attracting investment and driving innovation were common themes. And the desire to achieve significant growth in both exports and domestic opportunities was also raised frequently. Sector leaders and stakeholders identified much work ahead, including the need for sub-sectors to define bottom-up targets and strategies, and the need for credible data and good metrics to demonstrate progress on a variety of fronts, including sustainability and regulatory priorities. Of course, we also heard a lot of other points. We heard about infrastructure, transportation, rural internet and the need for timely access to new technologies, like drones, robotics and automation. We heard about challenges related to retail consolidation. We heard that business risk-management programs need to be recognized as productivity-enhancing, particularly with new climate-related challenges. We heard about the value of extension services in ensuring producers have access to the best information. We heard competing perspectives on supply management. We heard concerns about staff turnover impacting government capacity. We heard frustration about new front-of-package labelling rules and about carbon pricing. We heard about the need to better engage Indigenous communities, new Canadians and youth in the sector and about the role of immigration in addressing labour shortages. We heard a lot about the valuable role of educators — from Agriculture in the Classroom to colleges and universities — in attracting and training a diversity of people and talent. We were also reminded that Canada’s role in global food security goes beyond food exports, and includes important players that enable more sustainable food production, including technology, bio-economy, genomics, and input sectors, such as seed, fertilizer and pesticides. Industry-led global farmer education, such as 4-R Nutrient Stewardship, was also highlighted as a key example of Canadian leadership. But the most resounding message coming out of this coast-to-coast consultation is that now is the time to mobilize leaders from across the food system and governments, to build on the Advisory Council’s ideas, and to take bold action to make Canada an agri-food powerhouse. Food can unleash significant economic growth and deliver broad societal benefits. Now is the time to act on that. At each roundtable, we asked participants to offer one brief message to the Prime Minister. Here is a broadly representative sample of those messages, with one taken from each city. Thank you to our sponsors for your generous support. The food system includes: input suppliers, producers, processors, food services, retailers, and adjacent sectors (i.e., transportation, health, environment, education, science, technology, financial), and all levels of government. We work with government, the public service, the private sector, labour, academia, NGOs and Indigenous groups to improve policy outcomes for Canadians.